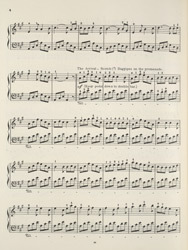 Sheet music was also used as a form of advertising during the 19th Century, largely because it was sold across the country. We can see from this music cover that trips to the Isle of Man were available. The price of a return ticket on 'The Manx Queen' was 4 shillings and just 2 shillings for children. The 19th Century saw the development of a thriving tourist industry in the Isle of Man. A promenade measuring 21/2 miles stretches along the sea front and the 'Gaity Theatre' designed by Frank Matcham opened in 1900. These attractions meant the Isle of Man was a popular tourist destination, especially for visitors from the north of Britain.